In 1982, I was living in St. Louis and working for McDonnell Douglas and I was part of a group of space enthusiasts who were planning for a Spaceweek event that summer. In May of that year, the first meeting was held of the St. Louis Space Frontier, a chapter of the L5 Society. Ten years later, changes in the aerospace industry caused me and several other chapter leaders to move away from Missouri, and after a few more years, the club went dormant. 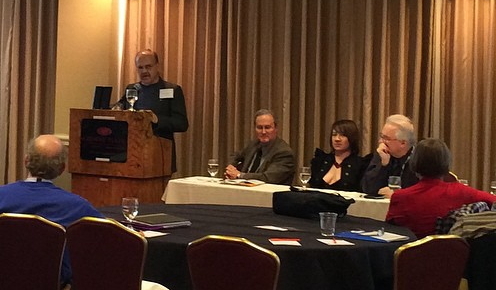 About a year ago, several of the folks who were involved in original chapter and some new folks decided to resurrect the St. Louis Space Frontier, and they just held a regional space development conference called Gateway to Space over the weekend of November 7-9, 2014. I had been in touch with the organizers and was happy to help them with this event, which I attended as both a presenter and a panel moderator. They had a very full and well-rounded program, with three parallel tracks going at times. The speakers covered all the usual topics at an NSS conference, from planetary science to commercial space to living on the Moon. A nice touch was the inclusion of arts and culture, with several artists exhibiting and even demonstrating their work, plus musicians and a fashion show. This event was well supported by the NSS national office, as they held a board of directors meeting in conjunction with the event. They have been encouraging chapters to hold regional conferences for some time, as these events were much more common back in the 1980s and 90s. Some of the board members who came included NSS executive director Mark Hopkins, Jeffrey Liss, Larry Ahearn, Dale Amon, Bruce Pittman, Al Globus, Lynne Zielinski, John Strickland, Dale Skran, and others. The presence of these folks enabled the St. Louis chapter to show what a small dedicated team can accomplish in regards to a weekend conference. Hopefully this success will encourage other chapters to host similar events. Such regional conferences can be an alternative to the often expensive and unwieldy ISDC event. Having more opportunities for space advocates to learn and interact is a good thing to support. How will we get there? What technology will we use? What is the path? Moon, asteroids, Mars, free-space? The panel was a bit large at eight members plus myself, but fortunately not everyone had charts and we had two full hours. It was a bit like herding cats, but everyone shared their perspective, and I attempted to relate how it is progress in this area is going to take ideas and inputs from experts coming from many backgrounds. The bottom line consensus, such as it was, it that government programs are not likely to lead directly to settlements, although they will help pave the way (by pushing the technology for example), and while settlements are probably going to have to be privately developed, the business plan for successfully achieving this involves a lot of arm waving. I had a lot of fun participating in and listening to all of the programming. What was most enjoyable was meeting up with people I had not seen in 22 years. There was a Friday evening event at the old McDonnell Douglas headquarters corporate museum called the Prologue Room. They had a group of retirees who had worked on the Mercury and Gemini capsules that were built in St. Louis. In this group was a former program manager and department head that I worked for, and it was really nice to talk to them and share my career story from the years since I left. And seeing old friends from the 1980s version of St. Louis Space Frontier was very special. I left with an optimistic feeling that there is new energy out there in people who still believe in the dream of exploring and living in space and the benefits that will bring to humanity. Hopefully this spirit of St. Louis will inspire other NSS chapters to pick up the pace and continue the work of outreach and awareness of the promise of the space frontier. I attended the 33rd International Space Development Conference from May 14-18, held in Los Angeles, CA. This is only the second ISDC I have been to since the early 1990s, when I was able to attend more frequently (I went to the Tucson event held in 2000). In that time a lot of progress has been made in the development of space, but a lot of things are still the same. This was a great conference from the perspective of being able to hear speakers offering the latest status and plans for all sorts of space exploration, business, and infrastructure initiatives. There were many “big names” from the space arena, including Buzz Aldrin, Elon Musk (SpaceX), Jeff Greason (XCOR), astronauts (Richard Garriott, Chris Ferguson, Rick Searfoss, etc. ), engineers and scientists (Dr. John Lewis, John Mankins, Geoffrey Notkin), and folks from the NewSpace community (Rick Tumlinson, Will Pomerantz, Taber McCallum, Art Dula, etc.). If anything, the conference was too big with too many tracks. Most days had seven or more parallel tracks. For someone like me who does not attend on a regular basis, and hopes to get some first hand updates on progress in these areas, you really have to pick and chose what sessions to attend. I thought there was some “fluff” that could have been eliminated to make things simpler (do we really need sessions on “Humans, Exponential Perception, Compassion, and the Universe”?). On the plus side, I was pleased to hear first-hand updates on such subjects as XCOR’s Lynx suborbital vehicle, space elevators, space solar power, utilization of space resources, and approaches to building affordable space infrastructure. There seems to be a consensus in this space community that a flexible infrastructure is needed more than a focussed development program aimed at a specific destination (say, Mars). By developing elements that can be used by all of these goals (Moon, Mars, asteroids, etc.) it is more likely that a sustainable space economy will actually occur. Over the past few years there seems to have been a debate over NASA’s future plans. Should they develop the advanced technology we need to make space exploration and development less costly and more effective (infrastructure), or should they pick a destination and develop just the technology needed for that specific goal? Most people at this conference were promoting the infrastructure path, which makes sense to me as well. The problem is that this is difficult to sell. It is much easier to get excited about sending a crew to Mars (or wherever) than designing a propellant depot at L2. Critics say NASA needs specific goals, but achieving those goals might come cheaper (and safer?) if we are patient and develop the elements we need to achieve any of the possible goals first, and even better if we can do it via commercial programs rather than via government-owned assets. The main disappointment I had at the conference was the lack of sessions on grass roots space advocacy. The membership of NSS is declining and aging. Many speakers encouraged us to get the word out to the general public about the exciting future of space exploration and development. This means grass roots, local level advocacy. There should have been sessions on doing small local conferences, how to work with schools, how to attract young members, how to find media contacts, how to write press releases, what to say to your Congressional representatives, etc. There were no formal sessions on this. The advantage of attending a conference like this in person (as compared to reading the presentations on line), however, is that you get to network with other like-minded advocates. Socializing at meal functions, between sessions, and at the Chapters Assembly meeting allowed me to meet many other NSS chapter activists. We were able to swap some ideas and propose new ones. This, more than anything,made attending this conference worth the effort and expense. The Phoenix, Arizona space advocacy societies held a joint Yuri’s Night event on Sat. April 12, 2014 on the campus of Arizona State University (ASU). The event was hosted by the ASU chapter of the Student for the Exploration and Development of Space (SEDS). Besides SEDS members, attendees included members of the local NSS and Moon Society chapters as well as others brought in via the MeetUp social network. There were over 30 people in attendance. The local AIAA Section provided financial support for the refreshments. The evening started off with pizza, wings, and soft drinks set up in a well-equipped conference room in the space science building. A Mars landing video game kept folks entertained, and foam rockets that Mike Mackowski brought from Orbital Sciences proved to be a hit, as missile battles ensued all across the room. There was much socializing and networking amonst the students, educators, and professionals in attendance. To cap it off, there was a showing of the original Star Wars movie (episode 4, if you must) in the building’s main auditorium. This was a great evening of celebrating Earth’s first venture into manned spaceflight. On April 12, 1961, Yuri Gagarin became the first person to orbit the Earth. To celebrate the anniversary of this milestone in space exploration, the Phoenix aerospace community is having a Yuri’s Night event on Saturday, April 12, 2014. This will be a fun evening of entertainment, food, and and socializing. For the past few years, the Phoenix chapters of the National Space Society and the Moon Society have held a Yuri’s Night event in conjunction with the Space Access conference. That conference is not occuring this year, so we are all joining up with the YN event hosted by the ASU chapter of the Students for the Exploration and Development of Space (SEDS). The event will be free and open to everyone. No advanced registration is required. You can sign up on the event’s Facebook page (https://www.facebook.com/events/1407954946126455/) if you want. The fun starts at 7 pm and will be held at the ISTB-4 building on the east side of the campus. Parking is available at the surface lot immediately south of the building or the Rural Road parking garage just east of ISTB-4. Parking is generally free on weekends in these lots. This primary sponsor of this event is the ASU chapter of SEDs, with with additional support provided by the Phoenix Section of American Institute of Aeronautics and Astronautics (AIAA), and the local chapters of the National Space Society and the Moon Society. I’ve been a little quiet recently on this blog. There has been activity in the way of space news (the successful Antares/Cygnus flight to ISS, an upgraded Falcon 9 launch, the successful LADEE lasercom experiment, etc.) but nothing that inspired me to write any new commentary. I’ve been busy with a number of activities involving outreach to schools and related STEM (science, technology, engineering, and math) projects. In fact, I could use some additional volunteers to meet the various requests we get for mentors and speakers. There are several K-12 schools looking for help, so contact me if you are interested. Coming up in early November is the SEDS (Students for the Exploration and Development of Space – sort of a campus-based version of NSS) annual SpaceVision conference which will be held at ASU in Tempe. The NSS leadership recently held their board of directors meeting, which triggered some discussions among chapter leaders across the country. The issue was the relative balance (within NSS) between chapter activities and broader national-level efforts. From my perspective, and my long history with this organization, you really need both. The national organization provides a highly visible public image and a voice in Washington, DC, while local chapters provide a venue for personal involvement and opportunities for grass roots activism. Focusing on local activities, and considering that most space policy decisions are made in Washington, what is the role of chapters in an organization like NSS? Consider the list of “E”s below. • A compelling local group can motivate members to stay involved, renew their membership, and recruit new members. If a chapter can grow and have a larger active membership base, they can take on more projects. • You can get info on line but you usually have to look for it. • Info acquired via an in-person presentation is often serendipitous and surprising. You could learn something you never expected. You could find something you weren’t looking for. You get to have a personal exchange with the presenter. It is much harder to do that on the internet. • There is a social aspect to any avocational pursuit. Space exploration is no different. Having a local chapter with interesting activities builds membership by keeping people involved, having fun, coming back, and encouraging new members. • The general public is under-educated about technology in general and space in particular. Most folks think the US has no space program. A chapter can perform public outreach and serve as a source of information for local media. This also creates opportunities to enhance membership. What this says to me is that being an effective space advocate is a lot more fun when you are doing it in concert with other like minded people. Being active in a chapter is a great way to make that happen, so please get involved and visit a chapter meeting or say hi on this blog or our Facebook page (https://www.facebook.com/groups/Moonsociety/). As most of you may know, lava tubes exist on the Moon and Mars (and Arizona!) and have been proposed as habitat locations for future off planet settlements. To get an idea of what these lava tube caves look like, the Phoenix chapters of the Moon Society and NSS are joining up with the local chapter of the American Institute of Aeronautics and Astronautics (AIAA – an engineering society) for a field trip to the cave near Flagstaff. Please join for a family friendly hike, 1.5 miles roundtrip through the lava tube in Flagstaff, AZ. These tubes symbolize lunar lava tubes. 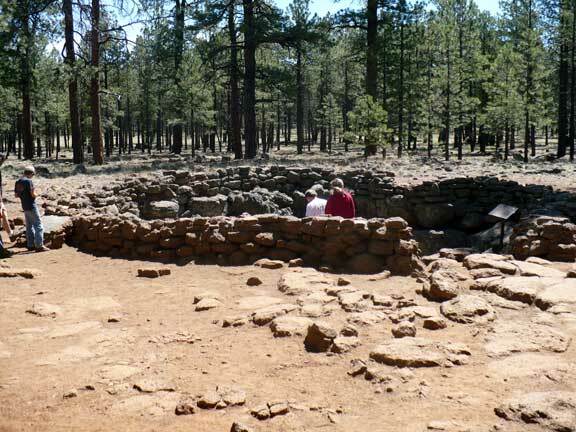 Explore the depths of Northern Arizona’s volcanic past with an underground hike. This very unusual hike will take you down a 700,000 year old lava tube discovered by lumbermen around 1915. Lunar lava tubes are sub-surface tunnels on the Moon that are believed to have formed during basaltic lava flows. When the surface of a lava tube cools, it forms a hardened lid that contains the ongoing lava flow beneath the surface in a conduit-shaped passage. Once the flow of lava diminishes, the tunnel may become drained, forming a hollow void. Lunar lava tubes may potentially serve a role as enclosures for manned habitats. These natural tunnels provide protection from cosmic ray radiation,meteorites, micrometeorites, and other impacts. They are shielded from the variations in temperature at the lunar surface, which would provide a stable environment for inhabitants. Location: About 14 miles north of Flagstaff on paved highways and graveled Forest Roads. staff on US 180 and turn west (left) on FR 245 (at milepost 230). Continue 3 miles to FR171 and turn south 1 mile to where FR 171B turns left a short distance to Lava River Cave. This will just give us an idea of how many people will be attending.